For a few hours’ ride, you should dress first-and-foremost for comfort. After all, your clothing shouldn’t hinder the journey. Well-selected material also helps. Cotton t-shirts have become rather a thing of the past, though they still have their admirers. Our cycling wardrobe should include breathable thermoactive clothing. It helps shed moisture, breathes, and what's more – dries very quickly, which is particularly useful when we get caught in the rain. We recommend cycling shorts with padding, which make even a several-hour ride less harsh, especially when off-road. It is important to choose the shorts and cycling insert according to your needs. Your comfort and health depend on it! Shorts should not be too tight or too loose – that increases the risk of chafing. The insert should be breathable, fast-wicking, quick-drying, and, above all, comfortable! What should I pack in? For a half-day trip around Gdansk, a small backpack should suffice. You can easily fit the most important things. It’s easy to pack, and if it weights 3-4 kg, very convenient. It can’t be too big, which makes it more difficult to look behind you and burdens the spine. In addition, your back will get sweaty quickly, making your ride much less comfortable. For shorter trips, we recommend a bag mounted on the handlebars. It’s an ideal solution for packing hand luggage. However, if you plan to pack more things, such as picnic blanket and store food, or children's clothes for the entire day, saddlebags will be more convenient. It is important to distribute the weight evenly on both sides. No matter which option you choose, opt for convenience and comfort. Waterproofing is essential. Cycling essentials, such as an extra inner tube, bicycle pump (there is a large selection of small, light pumps which attach to the frame of bike on the market at affordable prices), front and rear lights, and a repair kit – at the absolute minimum, a tire spoon, an Allen wrench, a set of tools, and some patches. What should I look for when renting a bike? If there’s a wide selection of bikes to rent, take advantage of that. It is important that the bike is well-selected, with the right size frame for our size and purpose (that is, whether you want a road, city, or mountain bike). Also take note of the condition of the bike, including any visible defects, which should be reported before renting. Gdansk does not yet have an urban bike sharing system, as in most Polish cities. Let us hope that will soon change. Where can I rent a bike in Gdansk? How can I carry my bike on public transportation? No matter which route you choose, you have to get to it somehow. Gdansk is a very well-connected city, so there surely won’t be any problem with that. That’s why we recommend public transportation. To travel by bus or tram with your bike, you simply need a normal passenger ticket. It is important that the bike does not endanger traffic safety or other passengers. The final say belongs to the driver, whose duty is to ensure the safety of travel for all passengers. If the vehicle is too crowded, for example, we must accept that the driver may refuse to allow you to enter with your bicycle. 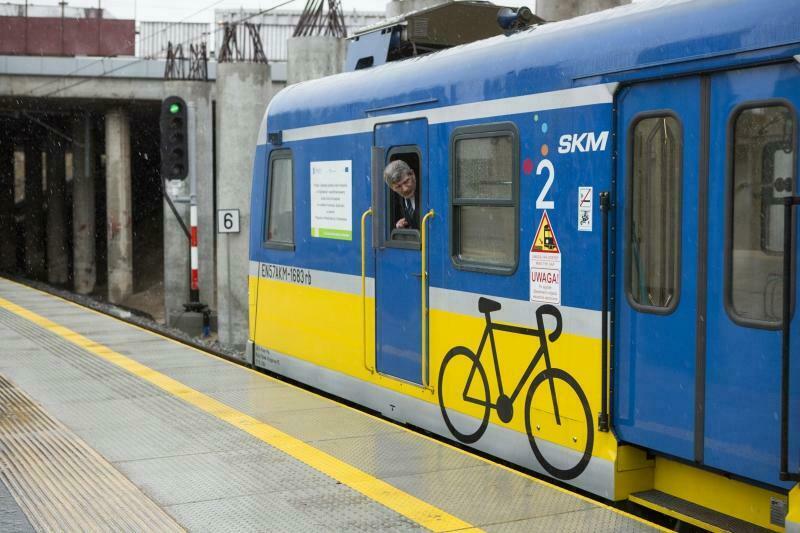 When it comes to travel on the SKM, or Fast Urban Railway, passengers with bikes should travel in the indicated car. Most often, that means either end of the car. Special bicycle racks are often available. When you decide to take a break from your ride, for example on the beach, remember to properly secure your bike. Unfortunately most bicycle locks and cables can be easily cut. We recommend U-locks. U-locks are most effective, but also quite cumbersome, due to their size. You can lock them to the rack on the back of the bike, put them in your saddlebag, backpack, or basket, or attach them to the frame of the bike using a special bracket. Together, or in a group? It is absolutely your choice. As with everything, both forms of travel offer two sides of the same coin. Riding alone means freedom, time to think, and choosing your own route, destination and pace. On the other hand, there are greater risks, lack of support in the event of a crisis, difficulties with motivation in moments of weakness, and lugging around a bunch of equipment with no one to share the burden. Today, we have many options when it comes to cycling forums on social media. Simply post an idea for a ride or express a desire to meet up on the date of your choice, and the opportunities present themselves. · A cyclist can receive the same ticket for talking on a mobile phone while riding as the driver of a car. It is also forbidden to hold headphones or a microphone while riding. A bike is a vehicle as any other. Carelessness could cost you a fine of 200 PLN. · At night, front and rear lights are obligatory for every cyclist. · Riding your bike under the influence of alcohol is prohibited. A person under the influence of alcohol (more than 0.5 per mille) risks a fine to 5,000 PLN or imprisonment for up to 30 days. Fortunately, the case doesn’t have to go to court. If a police officer finds that there is no need to impose a ban on riding, the cyclist may be fined from 50 to 500 PLN. · Do not ride on the pavement. Exceptions include those looking after a child under the age of 10 on a second bike, or cases where the prevailing weather conditions do not allow you to ride safely on the street (e.g. you would not be appropriately visible in bad weather conditions), where the pavement is at least 2 m wide, and where there is no separate bicycle path and the pavement runs along a rode with a speed limit in excess of 50km/hr. · Riding next to another cyclist is permitted only provided that you do not jeopardise the safety of other road users. That means you cannot ride side-by-side where other vehicles can’t pass freely (e.g. when other lanes are occupied, or where the road is too narrow or busy). Each cyclist, like each driver, should ride responsibly. All the more as many rules in the Polish Highway Code are not well defined.